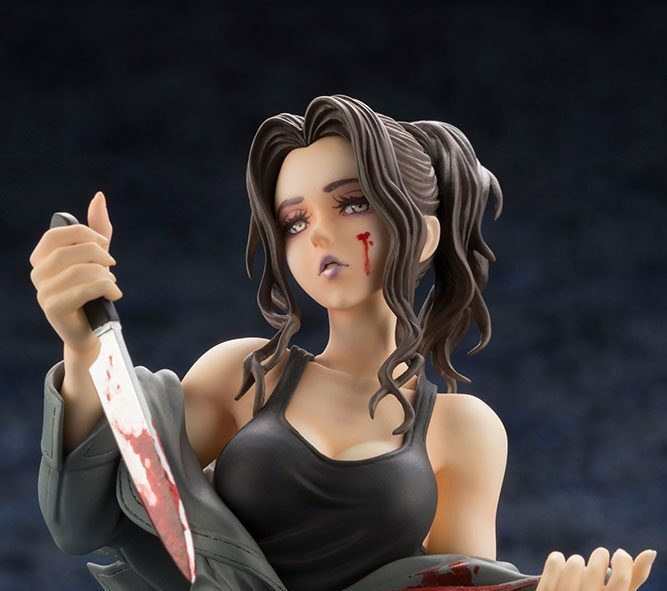 Everyone is celebrating this year’s 40th anniversary of Halloween in their own way, and the Japanese toy company Kotobukiya is getting in on the fun with a new Bishoujo (which translates to “beautiful girl”) version of Michael Myers that was unveiled at San Diego Comic-Con (SDCC). In one of the most unique Halloween-inspired collectibles we’ve ever seen, Michael Myers is transformed into the Bishoujo style by illustrator Shunya Yamashita. Stripping off her blood-splattered coveralls with a butcher knife in hand, the base features a jack-o-lantern and the Myers mask. Made of PVC and ABS, this statue stands roughly 9 1/4-inches tall. Kotobukiya has previously featured horror icons including Freddy Krueger, Jason Voorhees, Chucky, Ash Williams, and Pinhead in their Bishoujo line. To be released in June 2019, you can see a photo of the Kotobukiya Bishoujo Michael Myers statue below, and then pre-order yours from Entertainment Earth here.